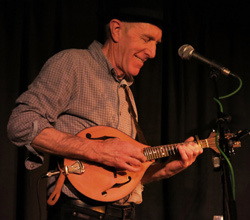 " I have been happily playing Paul Shippey's instruments for over 20 years, My first octave mandolin came from Paul when he was working out of Rod Button's shop in Weston-Super-Mare, it is a very playable, solid instrument, with good tone across the range still in good shape after many years hard playing. I commissioned Paul to build me his (and my) first 10-string mandolin over ten years ago, it's been my main instrument ever since, I have used it to perform with Shooglenifty, Malinky, Patsy Reid Band and many other artists. It just keeps on getting better, with great tone across the range, is loud enough to punch through in sessions and with the Baggs Element and D-Tar Preamp sounds rich and strong though a PA. Besides playability and great tone, one of the main reason's why I love my Shippey 10-String is reliability. It has taken a hell of a lot of abuse in many different climates from the hot, dry desert climate of Rajahstan to humid rainforests in Borneo and freezing Scottish stages at Hogmanay and never let me down! If you buy one of Paul's instruments you are taking home a creation made by a luthier who understands the needs of musicians, a finely crafted instrument which is the culmination of many years hard work honing skills, techniques and designs, combined with a passion to make musical instruments designed to last a lifetime. " "The (Shippey) A5 is a magnificent hand-crafted instrument with an outstanding tone and beautiful response across the whole range of the fingerboard." 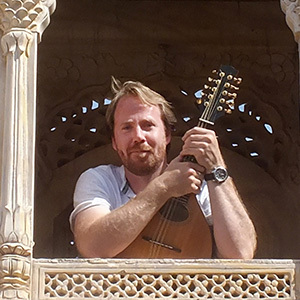 "Paul made me a Cittern that is a beautiful looking, playing and sounding instrument crafted to the highest standard. It cuts through the mix with a lovely full warm tone and looks the business." 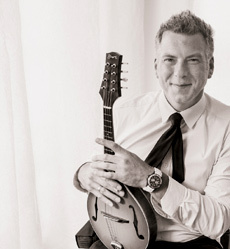 "For over 10 years now I've been playing and loving Paul's 10-string mandolin. At the time I was looking for an instrument that would give enough volume for playing acoustic sessions as well as a round mids, a warm bass and delicate high tones suitable for recordings. The instrument Paul built for me fulfilled all those wishes and gave me much more than that... The larger body and carved top are designed in a way that the bottom C-string blends harmonically with the other strings. It also gives that extra warmth that makes the instrument unique. In the MANdolinMAN quartet I play actually this gives me the ability to combine gentle melody and alto second voice playing. Besides that, for accompanying it combines wide range arpeggio playing with punchy strumming due to the extra bass string. Furthermore, being played on intensively for over 10 years in many different circumstances, the mandolin looks in amazingly almost mint condition. The many hours of finishing and polishing Paul applied on the instrument make it very protected against tough conditions, just like Ewan mentioned, though preserving the delicate look of the instrument." 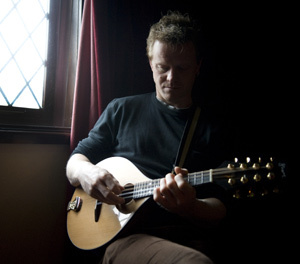 Ewan MacPherson of Shooglenifty playing his Shippey 10-string mandolin. 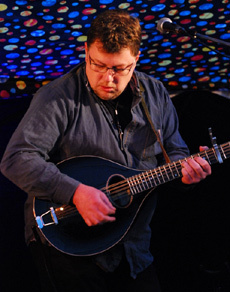 Ward plays a Shippey mandolin made in 2015. 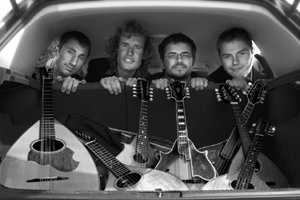 Plays a Shippey bouzouki and custom-made carved-top mandolin. Plays a Shippey A5 mandolin and Rosewood oval-hole mandolin. Plays a Shippey f-style mandolin. Plays a Shippey 10-string mandolin. Plays a Shippey solid body electric octave mandola and a Rosewood octave mandolin.